While on a business trip to Taiwan, I managed to squeeze an extra day into the trip for a stop in Tokyo. Takeo Yoshino, a long-time IEEE EMC Society Board member, had invited me to tour the Museum of Communications located in Chofu-shi and I decided to take him up on the offer. Takeo is the Honorary Chief Curator of the Museum. The tour was very interesting and the museum was populated with historically-significant artifacts. I hope you enjoy the pictures and the following description of my visit to the Museum. Takeo picked me up from my Tokyo hotel at about 1:00 pm on Saturday, March 27, and drove me to the University of Electro-Communications in Chofu-shi, Tokyo, Japan where the Museum of Communications is located. 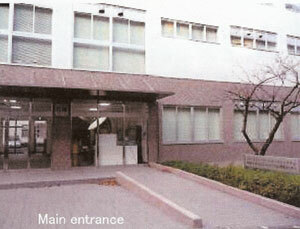 The main entrance of the Museum is shown below. I was met at the Museum by three of Yoshino-san’s associates; Takahiro Yukawa (Professor, Director of the University Library), Hisashi Ohtsuka (Researcher, UEC Communication Museum), and Masatomo Tanaka (Researcher of Historical Museum). We enjoyed some green tea and conversation in the meeting room of the Museum before the start of the tour. 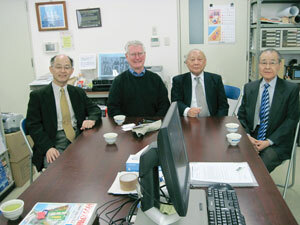 The picture below shows Takahiro Yukawa, on the left, then Mr. Hoolihan, Takeo Yoshino, and, on the far right, Hisashi Ohtsuka. We then began the tour of the Museum of Communications. The Museum is located in a two-story building; it is 52 meters long and varies in width between 8 and 12 meters. It has a total of 1070 square meters of space with a little over one-half of that being devoted to Exhibition Floor Space (558 m2). A layout of the Museum is shown on the following page. We started the first floor tour with a tour of Room 1 which is devoted to the “Transition to Wireless Apparatus” which includes transmitters, receivers, radio navigation aids, TV transmitters, transceivers for microwave relays, and a model of a traditional radio station on board a ship. It includes both commercial and military radio equipment. Room 2 is located on the second floor of the Museum. It is devoted to vintage radio receivers – both Japanese and American. It has traditional audio-visual equipment as well as some of the first computers. Audio and video recording machinery is also displayed. One of the more unique artifacts was a model of a Thomas Edison record player (which they played for me) with the original “cylindrical” records and a black 30dB-gain horn speaker. See the picture on page 31 for an insight into Room 2 and the Edison record player. 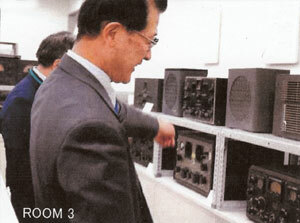 Room 3 has many radio receivers, both American and Japanese and both commercial and military style. One of the more famous receivers is a Hallicrafter Skydiver Diversity DD-1 equipped with an anti-fading function. 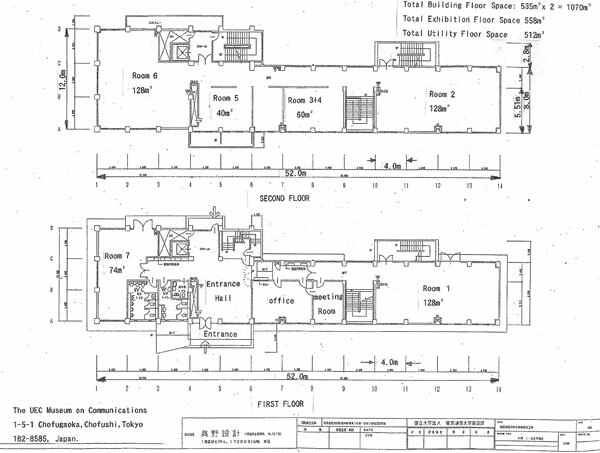 Room 4 is adjacent to Room 3 and contains a remote sensing device called the GMS “Himawari” signal processing system. A picture of some of the radio receivers in Room 3 is shown on page 31. Room 5 in the Museum is devoted to the origin of the University of Electro-Communications; the training of ship-based technicians with high-speed Morse code communication skills. Vacuum tubes of all sorts are found in Room 6. Everything from vacuum tubes by Thomas Edison and Nikola Tesla to modern-day vacuum tubes including a small vacuum tube from a Soviet MIG-29. 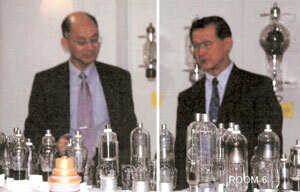 The tubes were used in receivers, transmitters, rectifiers, Cathode Ray Tubes, iconoscopes, and image orthicons and many other uses. Tubes to generate and amplify microwaves were also on view. The picture below shows some of the vacuum tubes on display in Room 6 of the Museum. Room 7 in the Museum is dedicated to early University of Electro-Communication research into Nuclear Magnetic Resonance (NMR), Electron Spin Resonance, and radio-calibrated clocks. It should be noted that the Entrance Hall to the Museum also contains examples of radio apparatus on board the INMARSAT ship earth station, a Narrowband Direct Printing System, an Emergency Position Indicating Radio Beacon for maritime distress, and Safety Systems (GMDSS).